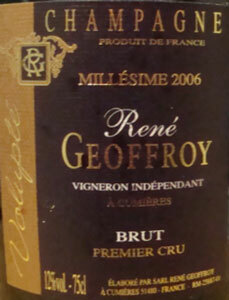 René Geoffroy Champagne - serious red grape dominated cuvees. 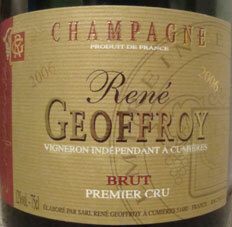 René Geoffroy Champagne makes serious red grape dominated wines which are exciting, fruity, and vibrant. They are made by a father-son team who make very high quality wine from their 14 Hectares of vines, and take it very seriously! The usual practices of high quality Grower Producers are practiced here, including manual harvesting, environmentally sound practices (they are not just good for the environment, they are great for the vines and wine), fruit thinning in July, bottling by hand, and in their new quarters in Aÿ, everything is done by gravity: there is no pumping required. They practice “Lutte Raisonnée” and belong to a group called “Ampelos” which formalizes it - it's close to certified organic, and includes random inspections. Their new quarters in Aÿ, on the same street as Deutz and Henri Goutorbe, reportedly has all the space and capabilities to push these already fine wines to higher levels. There is even an on site lab, useful for one who is always experimenting. For example they have done soil analysis to determine where to best plant Pinot Noir, and even planted one plot with Pinot Noir, Pinot Meunier, Chardonnay, and the ancient yet permitted Champagne varietals of Arbanne and Petit Meslier. Most of their vines, 11 Hectares, are in the village of Cumieres where the family has been growing grapes since the 1600s. The additional vines are in the village of Fleury-la-Riviere (Pinot Meunier) with a few additional lots in the village of Damery. All parcels of vines are vinified separately in enameled stainless steel, and some are aged in oak foudres. They are red grape heavy with 42% Pinot Noir, 39% Pinot Meunier, and only19% Chardonnay. Cumieres, in the Marne Valley, is a locally warm microclimate as it's one of the few villages with a south-east exposure and the grapes ripen quickly. It's usually among the first to be harvested in Champagne. Because of the warm climate, they avoid malolactic fermentation to preserve the acidity of the wines. Their wines tend to be quite dry and include two Non Vintage Bruts, the Cuvée Expression and Cuvée Volupté, the Vintage Millésime Extra Brut, Blanc de Rosé Brut, N.V. which contains Chardonnay and Pinot Noir, and their fantastic Rosé de Saignée Brut, N.V., 100% Pinot Noir, a wine that sells out very quickly. I was glad to get a bottle (thank you, Rare Wine Company) and see the tasting note below. 76% Pinot Noir, 10%Pinot Meunier and 14%Chardonnay, with 78% aged in wood, and 54% with malolactic fermentation with grapes come from Premier Cru sites in Cumieres and Hautvillers. The nose has apple, firm pear, spicy minerals, and chalk. The palate shows lots of spicy and minerally apple, a little touch of pineapple, and with air, pear and quince. Lovely wine that would merit a higher score with a bit more complexity, that perhaps it will achieve with age? The goal of Cuvee Volupte is to "provide the most beautiful expression of Chardonnay grown on the soil of Cumières" and although the blend varies from year to year, it is about 80% Chardonnay and 20% Pinot Noir and sometimes Meunier. The nose is minerals, bosc pear, a touch of dried pineapple, apple, touch of tangerine, and chalk. Quite a lovely and complex nose. 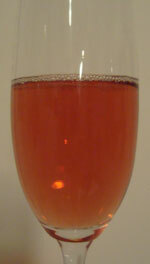 The palate initially has some juicy strawberry. Blind I could have thought this a rose, yet it is primarily Chardonnay. Rich, some pear, slight tangerine syrup, unsweetened pineapple. On the funky side palate wise as exemplified by the "tangerine syrup" note. I love it personally, but others might sense palate confusion. Although this is technically a non vintage wine, the grapes are all from the 2008 harvest and 100% Pinot Noir. I believe it hasn't spent enough time on its lees to be classified as a vintage wine, although it hasn't suffered one bit and it absolutely rocks if you like this style - and I do. It is also their sweetest wine, although it is certainly on the dry side itself. The color is a bold red with pink overtones. Some orange hues as well. The nose has lots of red fruits, roses, orange, almost a light candied aspect. Very elegant. A luscious spicy and earthy quality as it warms. The palate is bursting with red fruit: strawberries, raspberries. It is rich and exuberant. Truly festive, yet serious as well. Minerals and more red fruits on the long aftertaste - the term "spicy persistence" comes to mind. This is clearly a superb wine and some may think it needs food, but I find it quite a bit of fun by itself. 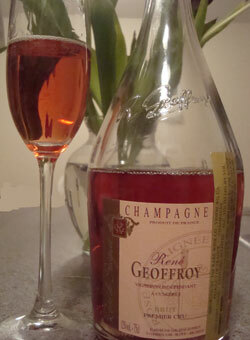 If this is what René Geoffroy Champagne is capable of, and they clearly are, I need to try more of their wines!